Vocal study differs from the study of any other musical instrument in that the work involves building and polishing the instrument itself... YOU! Every individual voice is unique, more or less developed, in healthy condition or with technical problems to resolve. Therefore, my approach is highly individualized; I have no pre-set "method" to apply to all vocal students because each student arrives in the studio with a different instrument, different background, different needs. 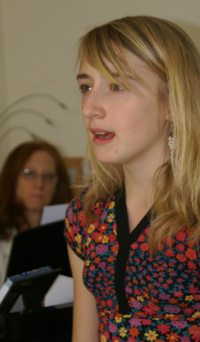 Every student, however, will be guided to develop a healthy vocal production and to discover the true voice that is unlocked when good vocal technique is established and the voice is freed of physical tensions. The technical aspects of vocal study are only one element of the big picture, however. The ultimate goal of refining one's vocal technique, of course, is to enable the student to make music, sing songs, be expressive! We work to establish a lovely sound, shape phrases musically, articulate clearly in order to serve the music and expression. Repertory is chosen from a variety of classical, folk, jazz, musical theater and light pop sources, depending on the interests of the student. Vocal music is unique in that it is as much about the text as it is about the music. I help students explore the special relationship between music and text in the repertory they study and to use their understanding to add depth to their interpretations. A singer must also be an actor; training helps each singer to communicate the emotional and intellectual content of the text. Attention to proper vocal technique ensures that the text is clearly articulated and comprehensible. Attention must also be paid to proper pronunciation and understanding of text when singing in foreign languages. I am well versed in English, French, German, Italian, Spanish, and Latin. My skills as a pianist ensure that I will be able to accompany you in your lessons, and I can prepare recordings of your accompaniments to facilitate your individual practice. Your vocal study will allow you to refine your technique, explore a wide range of repertory, and develop your interpretive and expressive abilities.